Last night, 20th Century Fox released the Alien: Covenant prologue, a four-minute introduction to the crew of the Covenant, a colonization ship on its way to a remote planet to form a new human settlement. 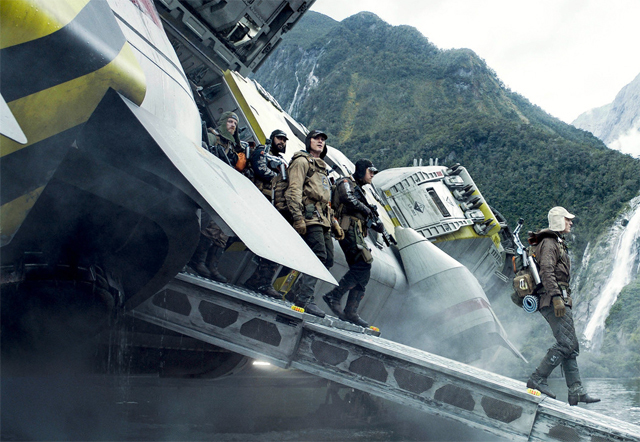 Now, Empire has released a new photo showing the crew as they disembark onto a lush new planet… though not the one they had intended to go to. Check out the new Alien: Covenant photo in the gallery below! RELATED: Watch the Official Alien: Covenant Prologue Film! The magazine confirms that the planet seen in the photo is a detour from their actual destination planet, which they visit as the result of a distress beacon. Ridley Scott returns to the universe he created with Alien: Covenant, a new chapter in his groundbreaking Alien franchise. The crew of the colony ship Covenant, bound for a remote planet on the far side of the galaxy, discovers what they think is an uncharted paradise, but is actually a dark, dangerous world. When they uncover a threat beyond their imagination, they must attempt a harrowing escape. Alien: Covenant stars Michael Fassbender, Katherine Waterston, Billy Crudup, Danny McBride, Demián Bichir, Carmen Ejogo, Amy Seimetz, Jussie Smollett, Callie Hernandez, Nathaniel Dean, Alexander England, Benjamin Rigby, and James Franco. Jack Paglen (Transcendence) and Michael Green (Green Lantern) provided the Alien: Covenant screenplay. Alien: Covenant will open in theaters on May 19.